This book is a MUST for everyone in and around the optics community! Fiber Optic Essentials provides professionals and students new to the field of fiber optics with a high-level knowledge of principles, theories and applications. This primer can also be used as a succinct overview of optics for those with some engineering and physics background. Individuals involved with optics in non-traditional capacities such as in marketing and legal departments will find this volume introduces basic concepts completely in an easy to read format. Casimer and Carolyn DeCusatis have provided a concise resource with compact chapters and minimal equations conveying this complex topic in a straightforward and clear-cut style. 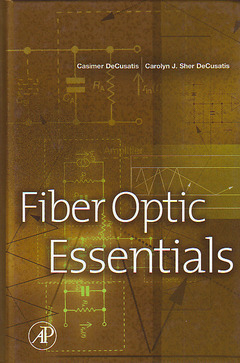 Included in this book are chapters on fibers, cables, connectors, transmitters, modulators, noise, and optical link design. Concluding this reference are three indispensable appendices covering extensive definitions, acronyms (including initials and commonly used slang), measurement conversions and physical constants. This author team has produced a book that has truly shed light on this difficult subject.